Is Jimmy Kimmel supposed to be a comedian or a political commentator? I don't know because I don't watch the guy because I don't find him funny. Either quit the show and go become a political commentator or stick to the jokes you're not that funny at to begin with. NY Post reports Jimmy Kimmel excoriated politicians who sent love to the families of Las Vegas shooting victims, but who won’t pass legislation to curb mass shootings in this country. 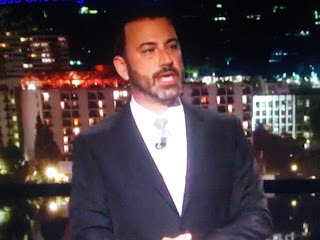 “Here we are again, in the aftermath of another terrible, inexplicably shocking and painful tragedy,” Kimmel began Monday night’s JKL, noting Las Vegas is his hometown. Jimmy is right, we should ban automatic weapons. Oops. They did that already? Maybe it's time Mr. Kimmel opens a used book store. He's not funny and he doesn't know from Shinola about guns or much of anything else. Makes you wonder who watches this wanker.